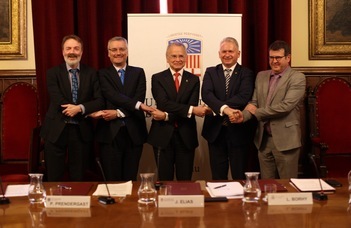 The University of Barcelona, Trinity College Dublin, Utrecht University, the University of Montpellier and Eötvös Loránd University, Budapest together launched Charm European University (Charm-EU), an alliance focusing on interdisciplinary, challenge-based education. The alliance presented itself during a press conference, held at the University of Barcelona. The rector of the institution, Joan Elias, noted that one of the objectives of this network will be the construction of a unique and innovative academic offering revolving the Sustainable Development Goals (SDGs), principles the members of the United Nations took on in 2015 in order to end with poverty, to protect the planet and guarantee prosperity. The rector of the UB highlighted three main aspects of Charm-EU. First, the broad language plurality these five participating universities bring. The future students of this alliance will be trained in an academic offering based on three romance languages –Catalan, Spanish and French- two Germanic languages –English and Dutch, apart from Hungarian and Gaelic. Moreover, this university will be based on international projects led by the five universities; it will be an open and inclusive university for people from all over the world. Last, Elias noted another objective of this network will be to “create a truly European learning experience”, meaning that it will take the best of the tradition of each country’s culture and will aim to integrate popular and academic culture. Therefore, students will be exposed to a unique cultural experience that will be expanded over their training period and will provide them with tools to become critical citizens in accordance to the European values. The Rector of Eötvös Loránd Univesity in Budapest, László Borhy, commented on the similarities between the objectives of the alliance and values of his university which intends to strengthen European identity and to transform the cultural heritage to achieve progress. “The new European university -he said- will offer an example regarding the standardization of academic and mobility programs for students. It will be -he added- a more flexible and sustainable system with the aim to respond the wide range of social needs”. Patrick Caron, Vice-Rector for International Affairs at the University of Montpellier, noted: “The first faculty of Medicine still active in Europe was created in the University of Montpellier, and was created thanks to the mobility and migration of the Mediterranean area. We never forgot about it”. According to Caron, being part of this alliance will enable the University of Montpellier “to contribute to strengthen European Values”, and facing challenges the University has committed to recently with the merge of the universities Montpellier 1 and Montpellier 2 in one, as well as “making the 2030 Agenda a reality”. In December 2017, the European Council decided to stimulate new networks of European universities aiming to improve the international competitiveness of higher education institutions and to strengthen the feeling of European membership, an idea that was previously mentioned by the President of France Emmanuel Macron. This initiative was launched and the first series of grant aid, within the EU Erasmus+ programme, has a funding of thirty million euros and will be published in July 2019.